Drive Medical Commode Bucket from HealthyKin.com is designed for use with Drive Medical commodes. The 7.5 quart bucket is for use with models 11112, 11148N, 11125KD, 11101W, 11149, NRS185006 and NER18500. 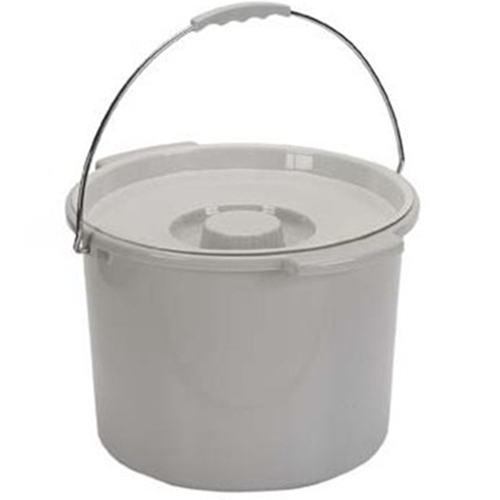 The 12 quart bucket is for use with models 11114KD, 11125PSKD, 11130, 11135 and 11105N. Got this as a replacement for my commode - I like that the lid fits well, works well w/ the sani-bags so can cover between uses. Works well and very happy with the speedy delivery. My commode came with a very small bucket. This one is the perfect size - great product! For the price works great. Probably would have ordered the deeper bucket if I had to order all over again, because it would splash less, but overall satisfied.